So this recipe is very, very vaguely adapted from ‘Délices méxicains’. 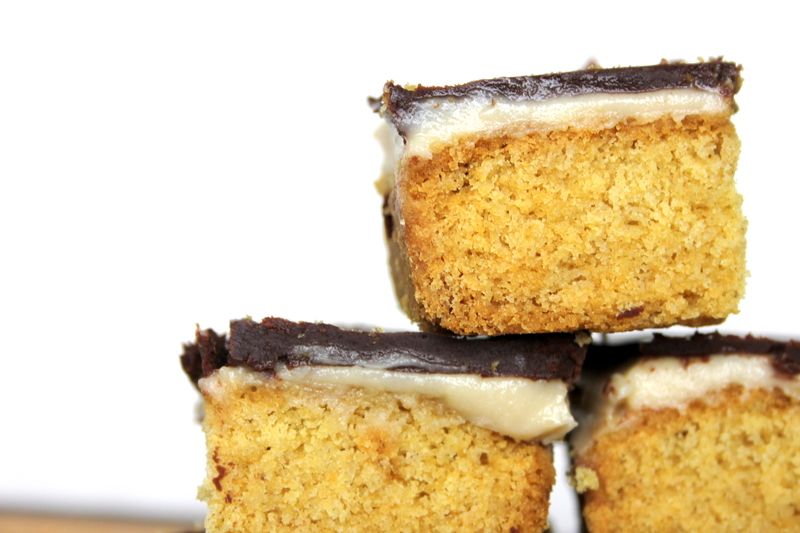 The original recipe is a sort of millionaire’s shortbread with a coconut base, fudge layer in the middle and chocolate coating, but to be honest my first attempt at the coconut layer was a failure, and I was too discouraged to try it again. 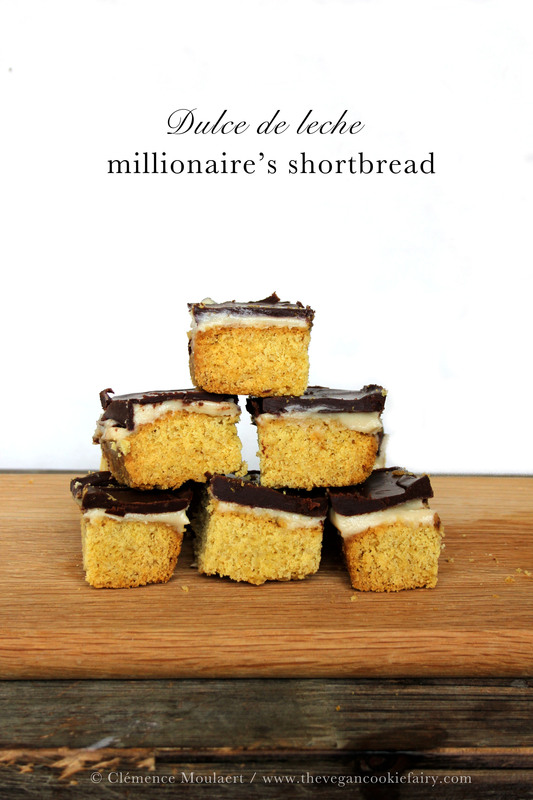 Since I had been hankering to try my hand at millionaire’s shortbread for about a month now, and it looks pretty much the same as délices méxicains, that’s the recipe I’m sharing with you today. I find these are easiest to make the night before you assemble the three layers as the dulce de leche layer needs to set for a few hours. I say dulce de leche – it should be a caramel layer, but there is, to my knowledge, no such thing as vegan condensed milk (yet) so I boiled down coconut milk and raw cane sugar until it became a thick, syrupy, and oh-so-sweet cream. Kind of like dulce de leche! It adds a cool texture to this dessert. So it’s not a traditional millionaire’s shortbread, but in my opinion it has a bit of the autumn spirit about it. I hope you like it! Don’t forget to tweet me @clemcookiefairy or share your creations on Instagram using the hashtags #thevegancookiefairy and tag me. 1. Pre-heat the oven to 180ºC (350ºF). Grease a small rectangular baking tin. 2. Place all the ingredients in a mixing bowl. You can use an electric mixer or a food processor to combine them into a smooth dough, or rough the ingredients together with your index and thumb. If working by hand, the mixture will first look like wet sand, then gradually stick together in a smooth, homogenous dough. 3. Press into the greased tin, ensuring it’s perfectly even. Prick the layer with a fork, then bake for 20 minutes. Get started on the second layer (dulce de leche) but don’t forget to remove your shortbread from the oven once it’s done and let it cool on a wire rack. 1. While the shortbread is baking, melt all the dulce de leche ingredients in a medium-sized saucepan. When the liquid starts to boil, reduce the heat till the liquid is simmering, but keep an eye on it and keep stirring regularly. It will take about half an hour to reduce by half of its original volume. 2. Cool completely, then pour over the cooled shortbread. Place in the fridge overnight to set. 1. Melt the ingredients on low heat in a small saucepan, stirring all the while. 3. Pour over the dulce de leche layer and return to the fridge for another two hours at least. Final step: once the chocolate layer has hardened, use a sharp knife to cut the shortbread into 12 equal pieces. Keeps in the fridge for up to 3 days in an airtight container. OMG, la décadence ………. Yummy.